Can a Politician Oppose War Without Being Called a Kremlin Stooge? PARIS -- Apparently it's now necessary for American political candidates to advocate endless interventionist wars, lest they end up accused of being a useful idiot for the Kremlin. The fact that Russian leadership happens to share a position on something doesn't mean that the position is invalid. If we learn tomorrow that Vladimir Putin likes Diet Coke, some people will see it as proof that Donald Trump is a Kremlin puppet. It is indeed possible for two different leaders to show a preference for the exact same thing -- such as not being bogged down in fruitless wars -- but for different reasons. And now it has come to this: A war veteran announcing her candidacy for president of the United States has been attacked by NBC News because she has a point of view that also happens to be held by the Russian president. Tulsi Gabbard, 37, a Democratic congresswoman from Hawaii, spent a year serving with a Hawaii National Guard field medical unit in a combat zone in Iraq -- a mission for which she volunteered. After graduating with honors from the Accelerated Officer Candidate School at the Alabama Military Academy, Gabbert deployed again to Kuwait as a military police officer, and she continues to serve as a major in the National Guard. On Saturday, Gabbard officially declared her candidacy for president. At her campaign kickoff event, she talked about ending the exploitation of American troops by politicians bent on regime change. "We must stand up ... against powerful politicians from both parties who sit in ivory towers thinking up new wars to wage [and] new places for people to die," Gabbard said. "These powerful politicians dishonor the sacrifices made by every one of my brothers and sisters in uniform, their families -- they are the ones who pay the price for these wars." NBC News analyst Alex Stamos is quoted in the story, saying that Gabbard's "promulgation of positions compatible with Russian geo strategic interests can help them mainstream such discussion in the [Democratic] party." Gabbert lashed out at the NBC story Sunday, citing a report by noted journalist Glen Greenwald that the only source NBC used was a firm that just got caught by the New York Times fabricating Russian troll accounts for the Democratic Party in the Alabama Senate race. 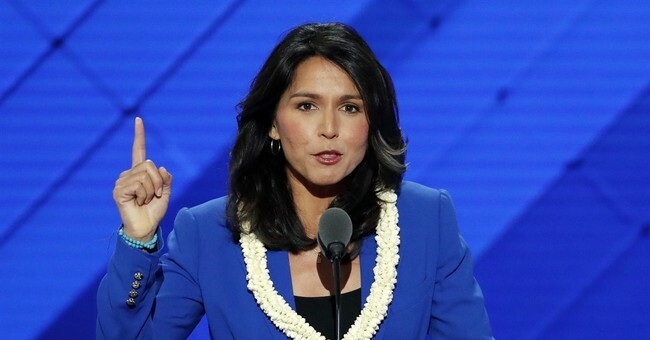 "Gabbard's most controversial position and the one where she's most in line with Russian interests is on Syria," wrote NBC News reporters Robert Windrem and Ben Popken. "She's accused the U.S. of pushing a policy of 'regime change' wars and in January 2017, she met with Syrian President Bashar Al-Assad in Syria on what she called a 'fact-finding mission.'" How is it "controversial" for Gabbard to be objectively correct in her assertions? There was indeed a U.S. policy of regime change in Syria. Her fact-finding meeting with Assad may have provided the information she needed to present her constituents with a more complete assessment of the situation. If more politicians showed the same sort of ambition to gather information on complex foreign-policy situations, we'd all be better off. Gabbard strikes a chord that transcends the ideological divide between Democrats and Republicans -- at least for those who aren't beholden to special interests. Politicians from both parties unite on little except for the call to intervene militarily in foreign countries. They might cite different reasons -- the left prefers "humanitarian intervention" while the right peddles fear (usually of terrorism) -- but the addiction to foreign meddling is a shared one. In the case of Syria, the left peddled the notion that Assad was oppressing Syrians, who needed support from America to fight back. American weapons ended up falling into the hands of terror groups, as American-trained fighters abandoned the cause and, in some cases, joined terror groups themselves. Meanwhile, the right said that America had to intervene to fight terrorism, even though the CIA's Operation Timber Sycamore was effectively creating more terrorists by training and equipping these non-state actors. Now, we're being sold the idea that duly elected Venezuelan President Nicolas Maduro has to be removed from power for humanitarian reasons. The arguments for Maduro's removal conveniently fail to mention the effect of stifling sanctions on the Venezuelan economy, or that an organized opposition working with interventionist elements is causing shortages by diverting daily necessities to the black market. The Washington Post reported in November that the Trump administration was considering adding Venezuela to a list of state sponsors of terrorism -- a move straight out of the foreign-intervention playbook. With her military background, Gabbard understands that American troops have been abused and misused to serve the agendas of soft-handed establishment politicians for whom the realities of war are little more than an abstraction. It's an insult to independent-minded Americans to suggest that anyone who aligns with her thinking is nothing more than a pawn of Putin.